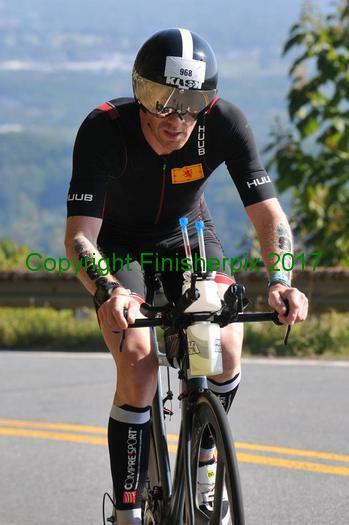 My goal this year was to try and qualify for the World 70.3 Championship. I hadn’t really thought about what would happen if I did. After my qualification event in Exmoor on 25th June, all I really wanted to do was have a rest, especially after a really tough year of training driven by Kevin at Blackzone Coaching. That rest would have to wait! A few recovery sessions and my training was just starting to ramp up. With only nine weeks until the World championships in Chattanooga Tennessee we had a lot to squeeze in to try and peak again. Six weeks of this was going to be floating in the Atlantic Ocean at work, which left 3 weeks on dry land. Kevin wanted to use this time like a training camp which sounded great. I’d been to one before in Lanzarote and it was really good. The Scottish version did not produce the same feeling with rain every day that eventually starts to wear you down. The physical side of the training was intense but it was the mental side that nearly broke me. I started to struggle to do some of the session once I was back at work offshore and the goal of competing in the world championship just wasn’t enough to keep me motivated. After almost a year of training harder than I have ever trained in the past all I wanted to do was STOP. A couple of conversations with Kevin and a few adjustments to the plan soon had me back on track and the excitement of what we were training for beginning to build. I’ve never thought of myself as a top age grouper in Triathlon even though I’m always in a respectable position in every race. This event was going to show me what I was really made of. I had no idea of where I could possibly finish or what I would be happy with. 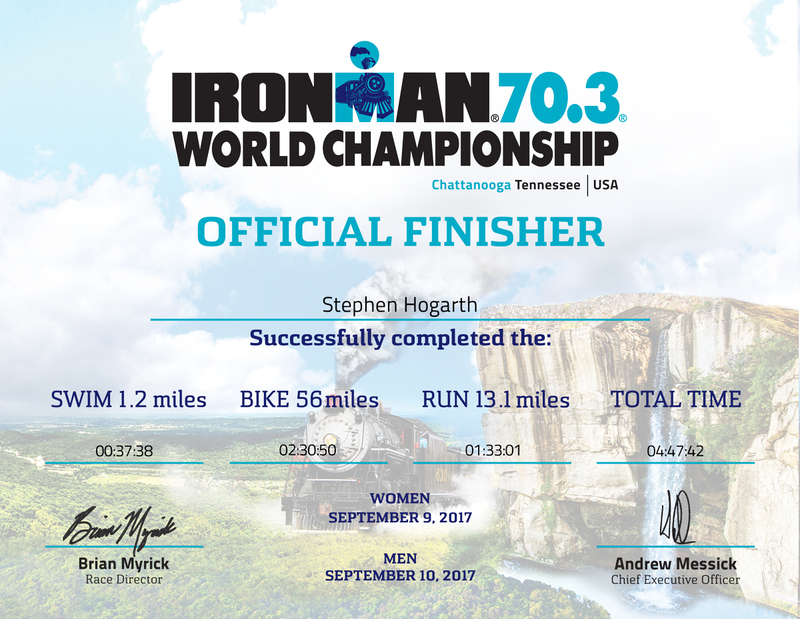 I’d already achieved my goal of qualifying and all I really wanted to do was enjoy the event and atmosphere that comes with Ironman. The morning of the event was very relaxed with a 9:20 am start time. It was still an early start as there was still the pre-race ritual to go through and transition area closed at 7. It was good to be a spectator for a while and watch the pro’s start as well as a few of the age groupers. As the start time grew closer my stomach was starting to churn, the toilet visits started to increase and the multiple checks to make sure I had everything. A quick kiss and good luck from my wife and it’s off to the start line for a quick warm up. Although we were the last age group to leave it felt like a race on its own with 340 athletes lining up. Like lambs to the slaughter we slowly made our way into the starting pens to get our race underway. I’m always glad when the swim is over and this would be no different. The majority of the swim was either across or upstream in the Tennessee river. 37 minutes is not a time to brag about but it could have been worse. 2 days earlier it was a non-wetsuit swim but thankfully the temperature dropped by 1 degree on race day to bring a smile to many a face. With the swim behind me and lying in 238th position in age group , it was time to get the legs spinning and try to move up the field. Transition was good and I soon settled into the bike immediately catching lots of people. I had my instruction and prescribed Wattage to follow. The first climb was only 6 mile in and I probably got a wee bit carried away. 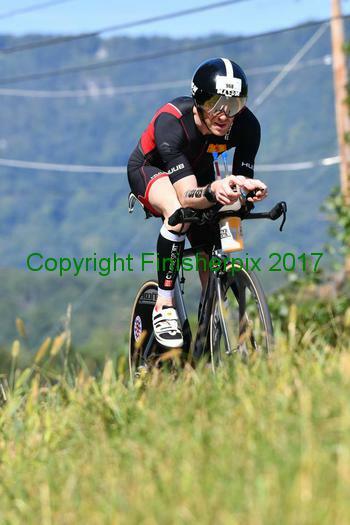 The bike felt good with the new disc wheels playing their part. With no fatigue in the legs it was easy to push above the planned watts . When I reached the 20 mile marker I remember thinking is that all I’ve done. So a quick sense check and stick to the plan was drummed back into the brain. The cycle route was really nice with great roads, awesome decent and a fast flattish finish. 2 ½ hours on the bike and the 56 mile was done. 2 down 1 to go. So after a textbook dismount it was a quick transition. Unlike one I had earlier in year when I went over the handlebars. I always know early on into the run if the legs are going to be good and today was going to be a good day. With such a late start time it was now 12:30 and the next 1:30 hours was going to be hot. I had decided that I was going to stop at every water station and take on some fluids. Only hindsight will know if this was the correct tactics. The course was hilly and I was never going to be able to do consistent split times but I was able to run at my target pace. The support on the course was great from spectators to fellow competitors. The locals with their garden hoses set up to cool you down and the cold wet sponges at all the feed stations were amazing and gave you a few seconds of relief from the heat. The first lap passed quite quickly and there was no sign of my pace slowing, so I kept to my strategy and after the last hill I started to stretch the legs and push for home. I felt really strong at the finish and crossed the line with a variety of emotions. 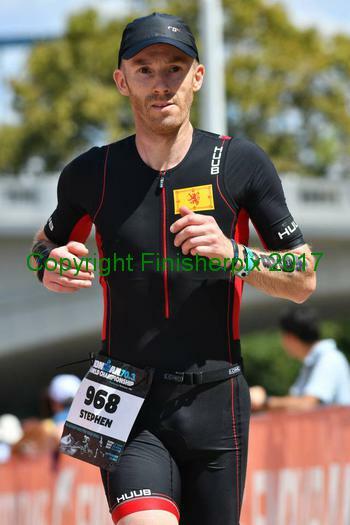 I was glad it was over, thankful to be in one piece, chuffed with my performance but most of all I was just enjoying where I was and taking in the buzz you get when you finish an Iron man event with the corridor of noise that greets you. It doesn’t matter if your first or last you’ll never forget it. The finish area was full of athletes from all over the world. Every one of them smiling, laughing chatting to complete strangers and congratulating each other on their efforts. 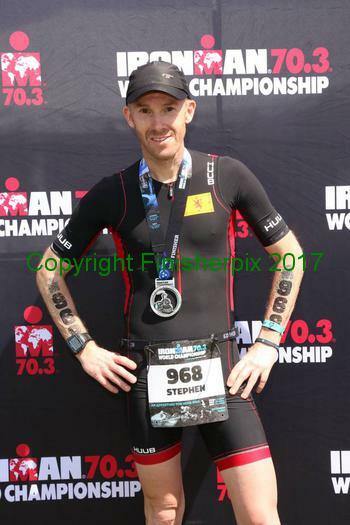 So a big thank you to Kevin from Blackzone coaching who not only got me to the World 70.3 Championship but also got me over another finish line, in 35th place, in the World, in my age group. I think I’ve done okay but this time I’m going to take that rest and enjoy it ! !